Trinity Revisited doesn't possess the rare magic of The Trinity Session, but it's a wonderful tribute to an album that continues to leave listeners in awe. Twenty years ago, a relatively unknown band named the Cowboy Junkies set up their instruments at the Holy Trinity Church in Toronto, Canada and recorded a collection of covers and originals. The premise was simple: one session, one microphone, the songs captured as they were in that single session without the benefit of later overdubs. From today's perspective, such an approach seems naïve in its daring simplicity, but it worked. Recorded for less than $1,000, the resulting album, The Trinity Session, made the band underground icons and critical favorites. Two decades later, the album is nothing short of being one of “those” albums … recordings so seminal that their impact is difficult to assess. The Trinity Session also made the Cowboy Junkies heroes for their emphasis on music that was authentic and uncomplicated. The selection of covers was impeccable, ranging from the Velvet Underground's “Sweet Jane” to Hank Williams' “I'm So Lonesome I Could Cry”, and the band turned such classics into slow, hazy trances of drone and swagger. Of course, when you're working with such strong material in the first place, it's hard to go wrong, but the Junkies also wrote some stellar originals: “Misguided Angel”; “I Don't Get It”; “To Love Is to Bury”. Taken together, the covers and originals revealed a band that respected the roots of modern music, but weren't afraid to tinker with or expand upon them. 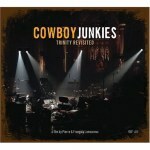 And now, exactly 20 years after the album that made their career, the Cowboy Junkies give us Trinity Revisited, which is just what it sounds like -- the exact same album rerecorded in the Holy Trinity Church. The only real difference is that now they've brought some friends, including Ryan Adams, Natalie Merchant, and Vic Chesnutt. “Why?” you might ask, and that is certainly a good question. Why risk tainting The Trinity Session's legacy by re-treading the same ground, especially when there's almost no room for improvement? Moreover, since the Junkies' career was made by, and peaked shortly after, The Trinity Session, could it be that what the band is really trying to revisit is critical glory by offering up the same batch of songs recorded at the same location and in the same order? Could they simply be calling attention to their own legacy and influence since their more recent albums haven't accomplished that goal? In the end, such questions are irrelevant if you view the album from the right perspective, which is to say you shouldn't compare it to the original. After all, while these are the same songs offered in their original order, they are inherently different. The band has 20 additional years of experience behind them, and their playing is inevitably more robust. True, by the standards of the Junkie's languid haze of a sound, more robust is still pretty relaxed, but many of the tracks do possess more of an edge. Even the opening track, the a cappella “Mining for Gold”, is more forthright and assured. And when you add the vocals of Adams, Chesnutt, and Merchant, you have something different altogether. Perhaps the only element that hasn't changed is Margo Timmins' voice, which is still as serene and enchanting as it was decades ago. Admittedly, some of these differences are distracting, if not jarring, for the first few listens. Chesnutt's unsteady growl, in particular, sounds like an odd juxtaposition to the hypnotic tranquility of the Junkies' music. When he takes a verse in “Blue Moon Revisited (Song for Elvis)” after Timmins lays down her vocal spell, it's an abrupt shift. And yet the pairing makes perfect sense. The band's music has always possessed an unsettling undercurrent, with tales of destructive love and painful longing eerie in their revelations. Chesnutt's voice, lurching and creaky, underscores such frightening glimpses of what lies underneath our desires. If anything, it is Merchant's voice, quite surprisingly, that sometimes sounds misplaced, as it does on “Misguided Angel”. This might be because she's trying to maintain the restrained composure of Timmins' original vocals, but Merchant is clearly at her best when she unleashes the range of her instrument. When she does allow her voice to break away for a second, you can't help but wish she'd do so more often. In terms of the music itself, the band's updated renditions are faithful enough to the originals to be immediately recognizable, but just different enough to offer something new. “Sweet Jane”, for example, doesn't reach its lazy daze until after an extended intro of clashing guitars and crashing drums. When the song proper does begin, psychedelic guitar wisps and burns over Timmins' sultry voice. Likewise, the bass intro to “Working on a Building” is deeper, and the drums are more pronounced. The result is a song that sounds more aggressive and foreboding, especially when Merchant and Chesnutt join in on vocals, effectively turning the song into a barnburner. Little changes like this are all over the album, making it an entirely different entity from its ancestor. And, for those wondering, there is more than one microphone here, which also explains why much of the instrumentation sounds louder. The film that accompanies the album, titled The Trinity Session Revisited -- A Documentary, makes an excellent companion piece to the songs, both shedding light on the recording of the original album and the rationale for revisiting it. In it, director Pierre Lamoureux says, “We're celebrating, not recreating … that 20th anniversary.” That, perhaps, is the best way to approach Trinity Revisited. Direct comparisons to the original only result in disappointment, but this shouldn't be surprising. After all, magical musical moments are as much about the cultural context in which they are created, and even if the Beatles were all alive and rerecorded Sgt. Pepper's, it just wouldn't be the same. It sure would be nice to see, though, wouldn't it? The same holds true here. Trinity Revisited doesn't possess the rare magic of the original, but it's a wonderful tribute to an album that continues to leave listeners in awe.